Luxuriate in Kate's most sophisticated skin regimen for extraordinary age defense. Designed for clients who desire the best for their skin, the KateCeuticals Collection is powered by dynamic, anti-aging technology that promotes renewal from within. Each high-performance ingredient has been hand-selected for exceptional quality. Use with ExfoliKate Intensive Exfoliating Treatment for powerful results that resurface, restore and revive skin back to youthful radiance. ExfoliKate Intensive Exfoliating Treatment, 2.0 oz. KateCeuticals Restor8 Replenishing Serum, 1.0 oz. KateCeuticals Multi-Active Revive Triple Peptide Cream, 1.7 oz. Skincare expert Kate Somerville partnered with top dermatologists and cosmetic surgeons as she pioneered the field of medi-spas. 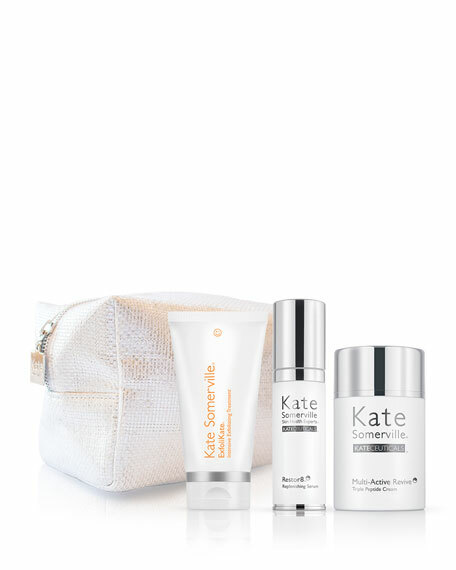 The respected skincare consultant to many of Hollywood's most recognizable faces is dedicated to research and development, and the Kate Somerville skincare collection features the same advanced products used in her West Hollywood clinic, designed for in-home use. For in-store inquiries, use sku #1594665.